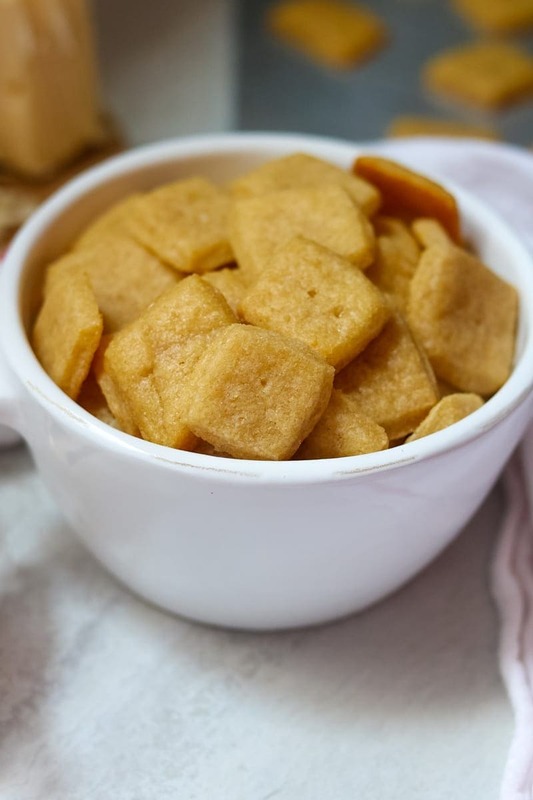 Homemade Cheese Crackers: A copycat Cheez-It recipe that your family is sure to enjoy! 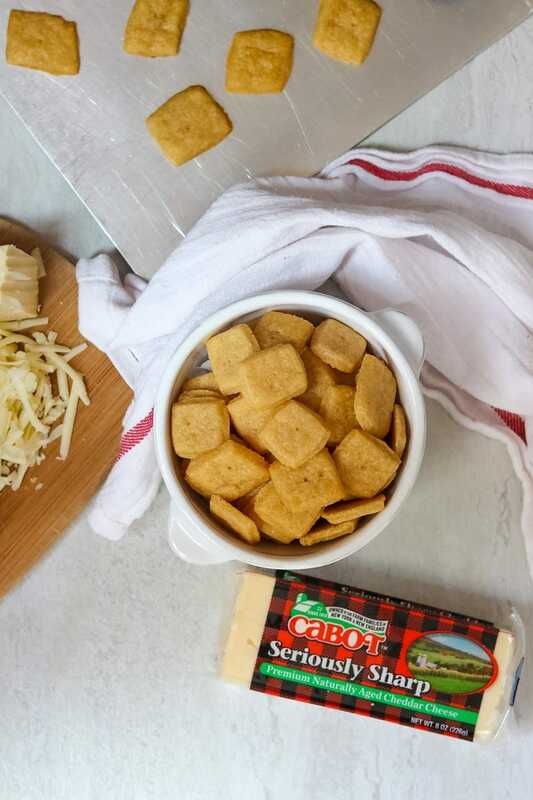 These cheese crackers are made with whole wheat flour and rich, sharp cheddar cheese. This post has been sponsored by Healthy Aperture, but opinions and recipe remain my own. My kids are snackers. And I am guessing if you have kids, your kids are snackers as well. 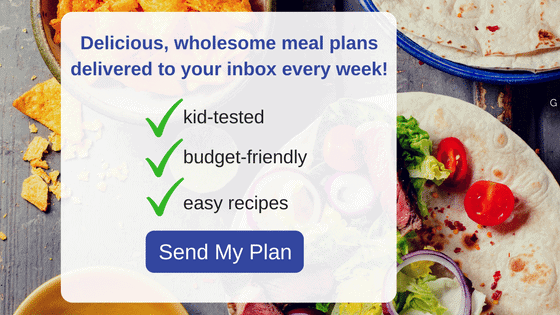 In fact, if my kids had their way, they would prefer that I packed them a lunch full of “snacks” like Gluten Free No Bake Granola Bars, Whole Wheat Blueberry Muffins, and Peanut Butter Yogurt Dip with fruit. But as much as my kids love my homemade goodies, they do ask for things that they see their friends having at lunch. Cheez It Crackers is one they used to request. And while I have nothing against the occasional store bought Cheez It Crackers, making my own cheese crackers at home is not only easy and healthier, even the kids agree the homemade Cheddar Crackers taste better than the store bought. With just a few ingredients and a food processor, you can easily whip up cheese crackers that are rich, buttery, flaky, and oh so tasty. And because you control the ingredients of the crackers, you can feel a bit better when your child grabs an extra handful-because you know they will! These cheese crackers also happen to be corn free, egg free, and nut free—perfect for those suffering from food allergies. Start with Cabot Extra Sharp Cheddar Cheese for maximum cheese flavor. Fit your food processor with a cheese grater and grate your cheese. It is best to grate cheese fresh, as buying pre-grated cheese has anti-caking agents and won’t melt into the crackers as well. Once the cheese is grated, change out the grater blade for the dough hook on your food processor. Add in the butter and seasonings and pulse the dough cheese and butter until it resembles sand. Add in the flour and process until the dough just comes together. Through opening on food processor lid, add in cold water while dough is mixing. Mix until just combined. Scoop dough out onto parchment paper, silicone baking sheet, or even wax paper and form into a flattened circle. Place another piece of parchment paper (or silicone baking mat or wax paper) on top of dough and roll out to about 1/8 inch thick. Allow the dough to chill in the refrigerator for at least 1 hour, or up to 24 hours. This allows the dough to get chilled and the butter to form air pockets in the crackers, keeping them light and crunchy. Using a knife, pizza cutter, or pastry cutter, cut dough into 1/2 inch strips lengthwise and then repeat width-wise to from 1/2 inch squares. Using, a toothpick or end of a skewer, poke a hole in the center of each cracker. This allows air to escape as the crackers bake, which is another reason these crackers stay light and crispy. Bake until crackers are just set and edges slightly browned. Be sure to watch carefully last couple minutes so crackers don’t burn. How do you store Homemade Cheese Crackers? Homemade cheese crackers should be kept in a tightly sealed container for up to 5 days. You want to be sure to seal the container in which you store the crackers well, as air will will cause the crackers to become soft or stale. To pack Cheese Crackers in a school lunch, place in snack size ziploc bag or small sealed container. These Cheese Crackers also freeze well. To freeze crackers, place in freezer bag and seal tight. Store for up to 3 months. To make great tasting cheese crackers, you need to start with quality cheese. Not only is Cabot Creamery Cheese delicious, they also are supporting family farmers. Cabot Creamery is deeply committed to making the finest cheese and dairy products on earth.They’re dairy farmers, they’re cheesemakers, they’re the 1,000 farmer-owners of Cabot Creamery Co-operative and they feel lucky that they get to do things their way. The right way. All Cabot Cheddars are naturally lactose-free and gluten-free. Cabot is a co-operative owned by 1,000 family farms throughout New England & New York and 100% of the profits go back to the farmers. I can not stress the importance of using freshly grated sharp cheddar cheese. You want to use freshly grated cheese so that these cheese does not contain any anti-caking agents–as this will change the consistency of these crackers. I used Cabot Sharp White Cheddar Cheese because I love the intense flavor of the cheese. Because this cheese is white in color, the crackers will not be as vivid of an orange color as store-bought cheese crackers. Feel free to use Cabot Mild Cheddar if you are looking for a less intense cheesy cracker. I prefer to use whole wheat flour in these cheese crackers, for a more wholesome snack choice. If you need Gluten-Free Cheese Crackers, use an all-purpose cup for cup gluten free flour. If you happen to not have a food processor, hand grate your cheese and then use 2 forks or pastry cutter to mix dough. An easy recipe for copy cat cheese it crackers. In a food processor, grate the cheese. Remove the grater from the food processor and put in the dough blade. Sprinkle the cheese with the salt and onion power and add in butter. Pulse until butter is distributed throughout cheese and mixture begins to resemble course sand. Add in flour and process until dough comes together. Through opening on food processor lid, add in cold water while dough is mixing. Mix until just combined. 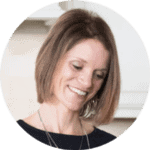 Scoop dough out onto parchment paper, silicone baking mats, or even wax paper and form into a flattened circle. Place another piece of parchment paper (or silcone baking mat or wax paper) on top of dough and roll out to about 1/8 inch thick. Using a knife, pizza cutter, or pastry cutter, cut dough into 1/2 inch strips lengthwise and then repeat width-wise to from 1/2 inch squares. Using, a toothpick or end of a skewer, poke a hole in the center of each cracker. Place cheese crackers onto baking sheet about 1/2 inch apart from each other. Bake for 10-13 minutes or until crackers are just set and edges slightly browned. Be sure to watch carefully last couple minutes so crackers don't burn. These look good. I like the nutrition information but there is no serving size indicated. 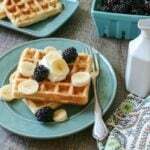 What is a serving? Thanks! Hi Barbara, the total recipe makes 16 servings–about 18-20 crackers each. 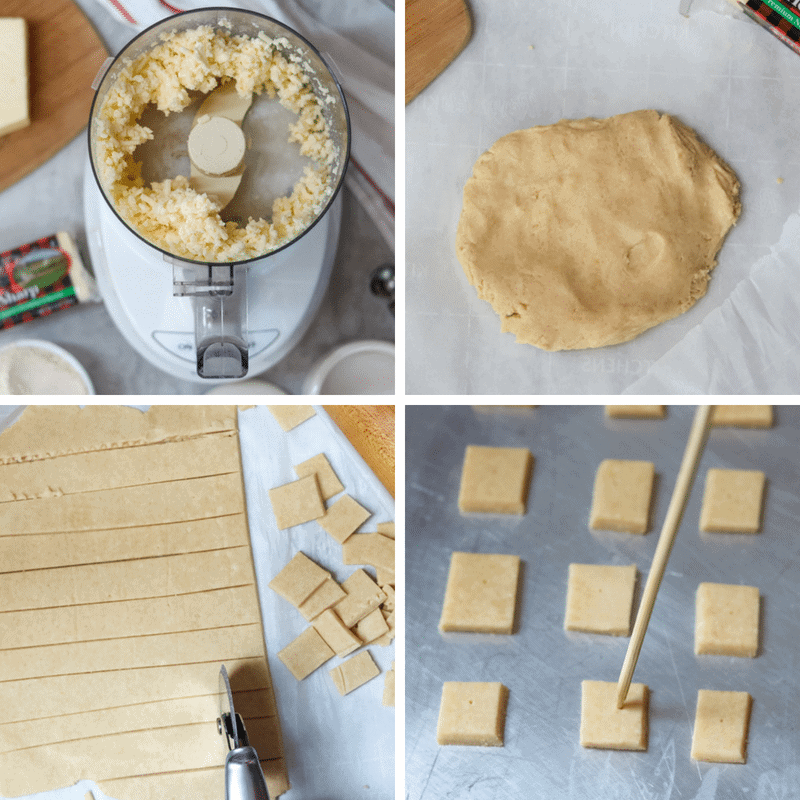 I had no idea homemade crackers could be so simple! Can’t wait to try it! So simple!! I hope you enjoy! I love the idea of homemade crackers because then you can lower the salt amount! Thanks for an amazing recipe! Yes, and for so many people that is SO important. Always best to be able to control what is in your food! Oh thank you so much! They are quite tasty for sure!